So, remember a couple of weeks ago when I mentioned that not cutting your grass attracts snakes? I wasn’t joking. About a month ago, after not cutting my grass for like a month because my lawnmower broke down and I had to take it into Sears for repairs (Long story short: the Sears guy had to remove a large rock from inside the mower. No, I don’t understand it either. ), I string-trimmed a snake. Don’t worry, I didn’t kill it. I think I stunned it though, because it just sat there and looked at me like – well, like I’d just walked up and shoved the business end of a string trimmer in its face, because that is exactly what I had done. I stood there and stared at it like an idiot because that’s what I do when I see a snake. It stared back, because that’s what snakes do when they see a human. I told you that so I could tell you this: about a week ago, despite having mowed my lawn at some point within the previous month, probably closer to the beginning than to the end of that month, I found a big damn snake in my garage. I mean, this snake was at least three or four feet long, although when I tell people about it, it was naturally forty feet long. I could tell it wasn’t venomous because of the shape of its head and because I have seen rat snakes before. 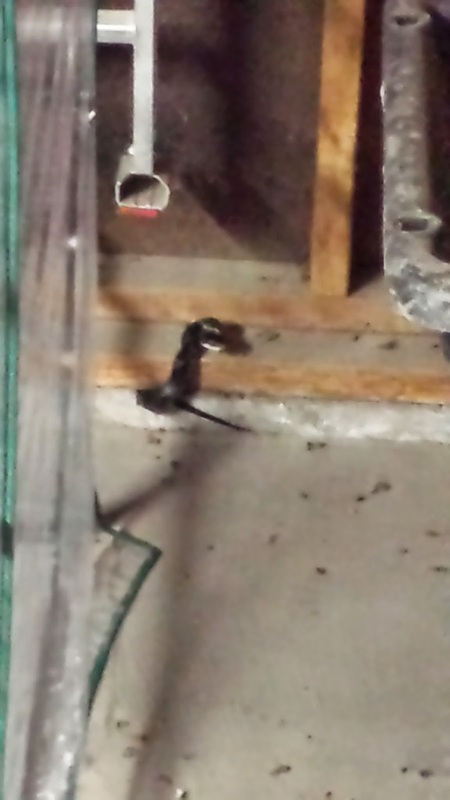 I spotted it slithering around in the corner of my garage when I was getting out of my car. My first reaction was, of course, to get out my phone and snap several pictures of the snake to post to Facebook. Not a lot goes on around here, you see. 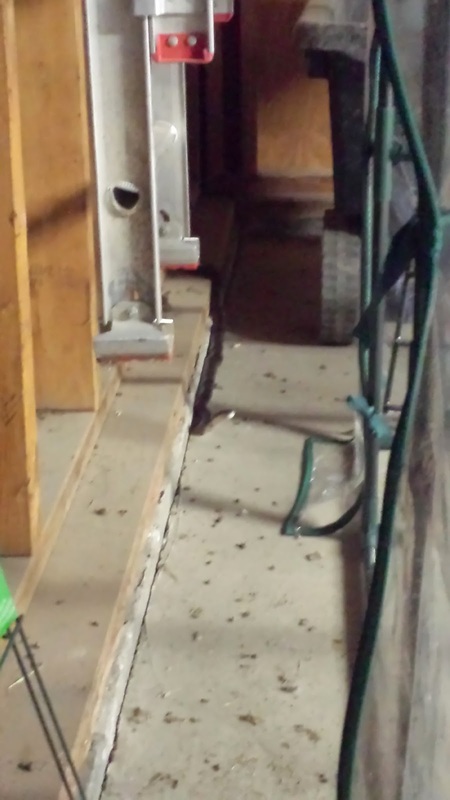 When you ask me what I’ve been up to lately and I just get real quiet instead of responding, it’s because I don’t want to say, “Well, the other day I saw a big damn snake in my garage,” but it’s either that, or nothing. Unfortunately, I couldn’t get a really good photo of the snake because several of my possessions were in the way, damn them, and I didn’t want to scare it by moving the wheelbarrow and everything. It's the thing with the head. I know this photo is kinda fuzzy, but I didn't want to get too close to the big damn snake. So in the end I just stood there and stared at the snake for several minutes, and it stared at me back. Then I realized I was in a Mexican standoff with a snake, so I put my snow shovel away and went back in the house. I haven’t seen the snake since. But I know it's out there, somewhere, mocking me.